I am a man of many (unicorn) horns: an academic, an organizer, a blogger, a snowboarder, a beauty pageant-winner, a dog-lover, a performance artist, a proud uncle, a model, Jeremy Lin’s #1 fan and the former Executive Director of Hyphen magazine. I was born in the O.C., raised in the SLC, spent some time in NYC, and now call Oakland home. I once accidentally insulted China’s ambassador to the U.N. in public, in Beijing. I was included on a list of “Inspiring Activists” by San Francisco Supervisor Jane Kim. If I could snowboard on soft powder forever, I would. I once appeared in an episode of Touched By An Angel. My favorite food is galbi-tang. My top 3 songs to sing in karaoke are “Forget About Dre,” “Sweet Child O’Mine,” and “Creep” (Radiohead, not TLC). I have finished five half-marathons. I am horrible at math and putting together furniture. The most beautiful building I’ve ever seen was the Blue Mosque in Istanbul. I am obsessed with the Utah Jazz. The best students I ever taught were at San Quentin Prison. I am learning to cook and have recently discovered something called celery. I am the son of a wandering backpacking hippie. I get bronchitis almost every year. My heroes are my friends and my friends are my heroes. I am trying to make myself better, and this world better. 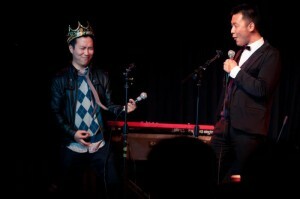 quoteBao Phi: Me and Terry Park used to be in a musical group called BTMD – Bao and Terry Making Dollars. This was prior to the extraterrestrial invasion and subsequent colonialization of Los Angeles, wherein both of us were forced to retire from the entertainment business and stand on corners handing out propaganda for our new alien overlords. Terry always did hand out flyers with panache though – nothing could dampen this spirit! quoteGiles Li: When I first met Terry, he was living in a hollowed-out refrigerator. We all thought he was homeless, but it was actually a performance art piece in which Terry disproved the claims put forth by special sitcom epsiodes of the 1980s. This was a specific rebuttal of the Punky Brewster episode where Cheri got locked inside an old discarded icebox and almost died. This backfired when Terry almost died. quoteRob Winder: Terry, one day your life will be the basis for a movie that won’t make any money, but will win several awards.